Minimum Order Quantity :- 50 Boxes. 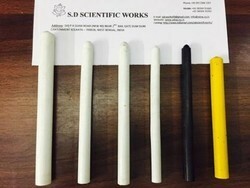 Colour and Temperature : Upto 1400 Deg C, Colour White Black and Yellow. Mainly Used in Steel Plants for Marking Purpose on Hot Surface like Billets, Blooms, Bars, Ingots, Ductile Iron Pipe, Spun Pipe etc. Century’s Hot Marking Chalk is a unique tool to mark onto red hot surfaces. It is widely used in industrial applications for coding & identification purposes. 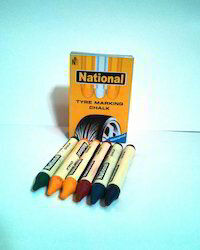 Rose trye marker is specially made for smooth writing on tyres and rubbers. The Marking Chalk are provided by us is durable, damage-resistant and long-lasting. This product is manufactured for specially Hot/Cold Graphite Electrode, Steel Ingot, Tyres, Tubes and Wood in forest Deportment and Other Things for marking. This product is wild used in garments, textiles and leathers. Jai Shree Shyam Trading Co.